The Tamana Girls HS Band from Kumamoto (They have competed at the All Japan Band Association’s National Finals 7 time and received a gold medal – champion of Japan – 3 times. 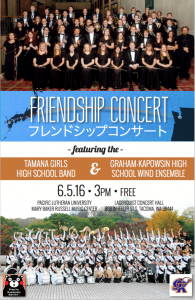 They aslo have competed at the All Japan Marching Contest’s National Finals 18 times and received a gold medal -champion of Japan – 14 times) is performing with the Grahama-Kapowsin High School Wind Ensemble led by Paul Bain. 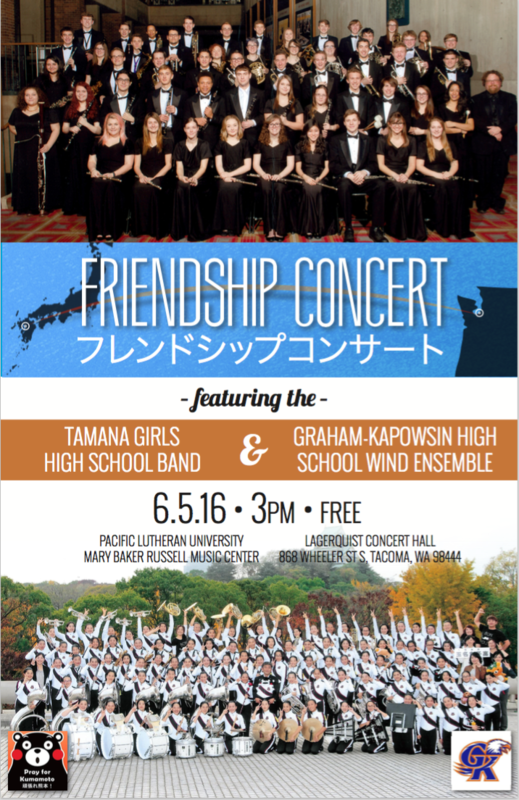 Come and witness how those wonderful students communicate thought music. I guarantee that it is going to be a magical Sunday afternoon for you! This entry was posted in Community Events, Kenjin Kai Activities on May 19, 2016 by Administrator.